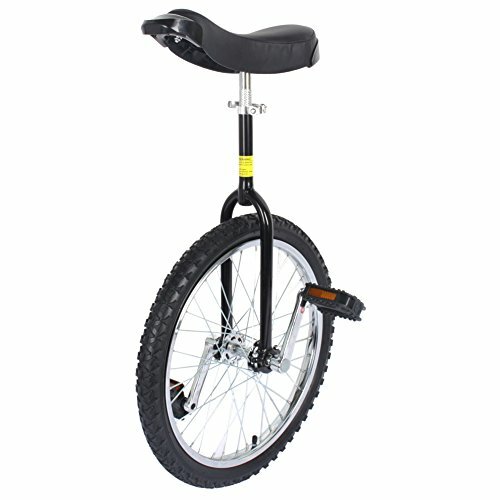 Weight limit: 143Lbs, fits to applicable height from 57" to 69"
Distance from seat to pedal: 15" - 32"
Adjustable bicycle height: 32" - 36"
STURDY FRAME :Unicycle bike Made by strong manganese steel with fine design, more durable and safer.Brand new 20-inch Wheel Unicycle with somatological design and top quality. COMFORTABLE :The Unicycle with standard comfortable seat ,it is designed by Ergonomic, omfortable and durable, Large saddle in unique design for extra comfort & safety.It will not be uncomfortable even if long time used.the RUBBER TYRE increased safety and comfort. RUBBER TYRE:The tire is Anti-skid design, give you a great compression performance,Cartridge bearings for smooth pedaling.ust like surfboards and skimboards on sea, skateboards on ground and wire-walking in the air, it is also a sport of training your balance and strength to ride unicycles. ANTI-SKID PEDAL AND SCREWS: The pedal are design to anti-collision and anti-fall. The screws are made by stainless steel screws, committed to every detail.duable and long service time. EXERCISE YOUR BALANCE :Just like surfboards and skimboards on sea, skateboards on ground and wire- walking in the air, it is also a sport of training your balance and strength to ride unicycles. If you have any questions about this product by Estink, contact us by completing and submitting the form below. If you are looking for a specif part number, please include it with your message.